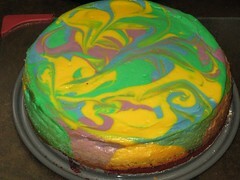 All day Monday, JL and I kept talking about how we could not wait to try the Tie-Dyed Cheesecake experiment that we made on Sunday. We were anxious to see if it would live up to our memories of the amazing cake that we had while at Disney’s Pop Century Resort in May. Monday evening finally arrived. JL and I dropped the boys off to have dinner with Nana and Papa. From here we drove to a new Chinese/Japanese/Thai restaurant to try. On our way we saw the fire engine that was mentioned on my Worldess Wednesday. It was so nice having dinner together and not worrying about what the kids would eat. 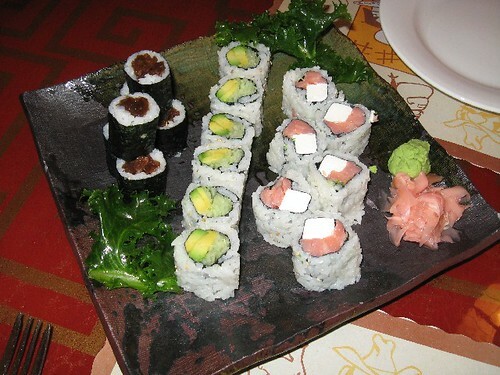 We quickly decided on some sushi rolls to share and ordered our meal. After a little while, our sushi appetizer arrived. Not only did it look amazing, it was absolutely delicious. Just as we were finishing these up, our meals arrived. 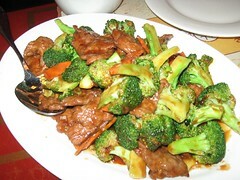 I decided to go with something safe, but not something that I typically get (beef and broccoli) and JL tried something quite different (spicy orange tofu). 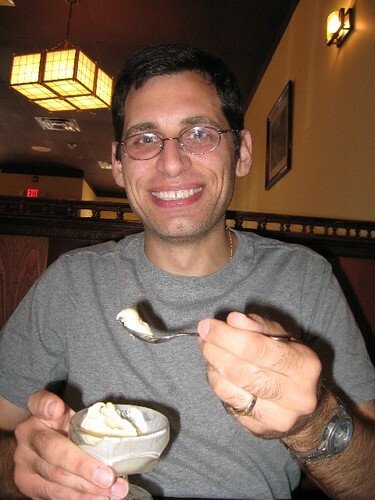 Thanks to my digital camera being with us most of the time, we were able to capture the photos of our wonderful meal. Of course, taking photos during your meal gets you looks. Our waitress came over. Of course, I had to explain that we blog and take pictures to show JL’s birthday meal. A little while later, while waiting for our packaged leftovers, the waitress and another come over. The two of them were singing happy birthday to JL while carrying ice cream with a lit candle on top. 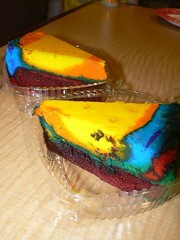 Once we were done with dinner, we went back to my parent’s house to have the much anticipated Tie-Dyed Cheesecake. I quickly opened up the spring form pan so we were able to see more of the colors. 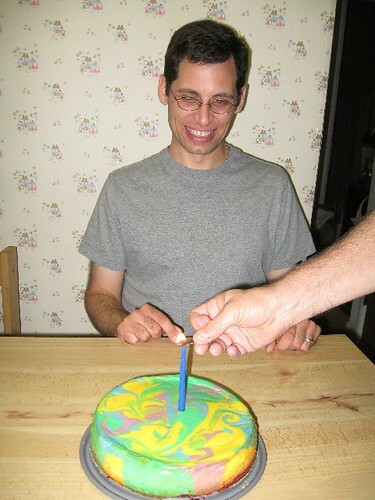 Then it was time to sing Happy Birthday to JL and dig into the cake. Finally, it was time to cut inside and see if it looked anything like the much loved cake from Disney’s Pop Century Resort. 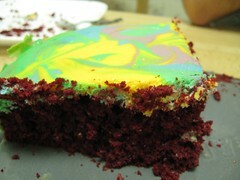 Here is a reminder of what the cake there looked like. 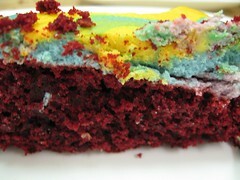 This is what we saw when we sliced inside the cake . . .
As you can imagine, we were all disappointed. It looked nothing like the cake of our dreams from the memories in May. This cake was 2/3 red velvet and only 1/3 cheesecake. NHL actually thought the cheesecake was frosting on top of the regular cake. Basically the proportions of the cake were flipped. Don’t get me wrong, the recipe is not a bust. It was not horrible. However, as cheesecake fans we loved the cheesecake part, which was a mere blip in the cake. In the end, we figure we would try this recipe again. 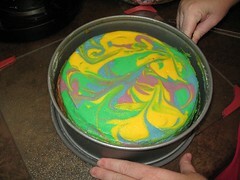 Next time we would likely use 1/3 of the cake mix, or possibly only 1/4 of it. Then we would at least double the cheesecake portion. We figure this would fix the proportions. 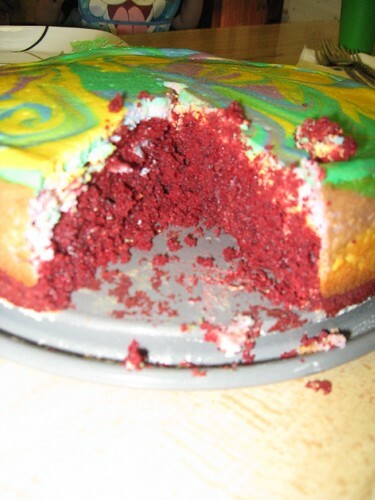 In addition to this, we would not cook the red velvet all the way during the first time in the oven. We figure mostly baked would allow it not to dry out quite as much. Of course, we may also try this recipe that my friend who made this on Monday found after we had both made these cheesecakes. Certainly not going to be any complaints from the family about eating another cheesecake! Submitted as part of Grace’s Kitchen Friends on Feels Like Home. 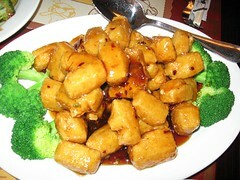 I love orange tofu fried crispy like that. It’s one of my favorites! Thanks for linking up in Grace’s Kitchen! I love the theirs vs. ours picture! I can’t wait to see how the continued experiments go. That cake was very pretty even though it was too much cake and not enough cheese. I wouldn’t have complained once if you put that in front of me to eat. :) Let me know how take 2 of this recipe goes.